H. Carl Trimble III was born and raised in Tyler, Texas. Married for over 50 years, he has two grown daughters and a son who is a former U.S. Army combat medic. Three precious little girls call him Papaw, and a new grandson soon will be. Carl is a graduate of Tyler High School, Tyler Jr. College, and the University of Texas at Tyler where he received a BFA in 1987. He holds a MFA from The University of North Texas in Denton, Texas. He is a U.S. Navy veteran and has been active in his church and community wherever he has lived. As an architectural glass artist, I do not seek to see how cheaply I can create something, rather how well I can do it. Carl is a Professional Affiliate of the American Institute of Architects/Dallas. His professional service has also included serving on the Board of Directors of the Texas Fine Arts Association and the Texas Visual Arts Association, and serving two separate terms as president of the Dallas Society of Glass Artists. He was the primary organizer of the Texas Glass Artists Association. 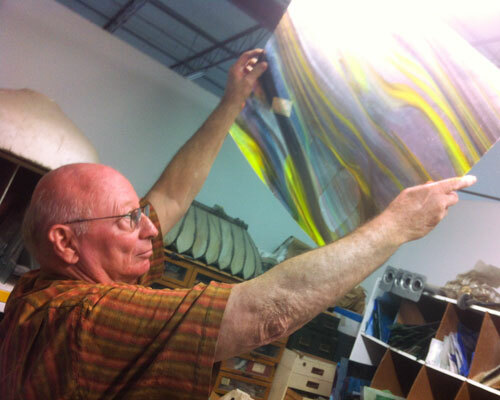 Carl Trimble and his company, based in Dallas, Texas, restores contemporary and historic art glass, and they also take design projects for new construction. Their installations can be found over a wide section of the Eastern United States, and these include historic buildings, churches, commercial buildings, restaurants and more. Examples in Dallas include The Mansion on Turtle Creek, Gleneagles Country Club, The Petroleum Club in Fort Worth, and Park City club in Preston Center. Other examples span the Eastern U.S., including Trammel Crow in Atlanta, GA and a 1914 courthouse in Edgewater, NJ.